World Martial Arts Academy provides quality instruction and service with a view toward the overall health and well-being of every participant. Our philosophy ensures that learning will take place in a safe, nurturing environment. We care about our students, families, and staff, and we provide a supportive environment for learning and personal growth. World Martial Arts Academy where nothing is impossible. Taekwondo is a total learning activity. Lessons are tailored to your child's age and skill level. 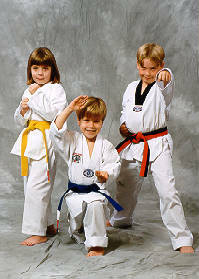 Your child begins by practicing basic patterns and forms, board breaking, kicking, blocking, striking, and punching. These fundamental skills increase your child's physical coordination, flexibility, balance, and mental acumen. The self-discipline that develops as a result of learning and practicing the techniques usually carries over into other areas of the child's life. School grades often improve as your child learns to focus on objectives and to work toward achievement. The self-discipline and self-resect which Taekwondo develops can provide your child with the skills and mindset necessary to resist peer pressure. Let your child experience the benefits of World Martial Arts Academy. World Martial Arts Academy's adult programs help you develop and maintain a sound body and mind, and increase your abilities at self-defense. Taekwondo strengthens your body and improves your health through physical exercise and conditioning. Isometric and dynamic tension exercises will allow you to gain better muscle tone and more strength. A gradual building process of safe and easy stretching techniques will enhance flexibility, while breathing and concentration exercises lead to sharper reflexes and senses. The discipline of Taekwondo leads to increase energy, better health and fitness, greater coordination, and higher self-esteem. These qualities are vital to a happier, longer life. Enroll today. Experience the advantages of World Martial Arts Academy. Overcome fear, self-doubt, anger, jealousy, laziness, and bad habits. You can do it! It takes serious, dedicated training, and most of all, it takes the right program. World Martial Arts Academy offers a carefully planned program of exercise, visualization and instruction that is ideal for self-development, because it exercises all of you! At WMAA you visualize your goals as you practice effective self-defense techniques. This unique combination of physical and mental training creates breakthroughs in personal transformation! Who Studies the Martial Arts? People from all walks of life, all races and religions. Young and old alike study Taekwondo. Students include engineers, computer programmers, doctors, lawyers psychologists, small business owners, musicians, college, high school and elementary school students, nurses, housewives and many more. Everyone can benefit from WMAA. 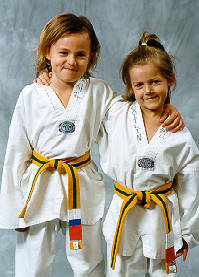 Currently there are over 20 million Taekwondo students world-wide. Taekwondo is both an ancient Korean Martial Art, and a modern International Olympic sport. Taekwondo is a mental and physical discipline designed over 2000 years with the ultimate goal being mental and physical health. That is the health of ourselves, our family and our friends. Taekwondo serves as a means of self-protection, giving one the assurance of being able to do so if the need arises. Our program is styled to keep the body conditioned, and the mind clear. It provides confidence and self-control. These goals are accomplished through the quality instruction received at WMAA, combined with your strong desire and regular training. Learn to defend yourself through rigorous, comprehensive training. Develop your endurance, strength, flexibility, and balance along with your self-defense techniques. Learn to defend yourself, not only physically, but mentally as well. Learn to unite your body in a single effort to achieve your goals. Develop an inner calm. Bring up deep-rooted, long hidden fears and weaknesses, face them, and conquer them. Bring out anger and frustration in a positive environment where you can learn to deal with them effectively. Rise above laziness and inner doubt. Why study the Martial Arts? I can't imagine why not! It's great exercise, I'm more coordinated, I'm the healthiest I've ever been, and many comment that I look younger. My pulse rate has dropped 20 beats per minute, I'm more energetic and calm. I've gained the self-confidence to know I can overcome anything. Grandmaster Rho has helped me gain all this, and much more. He has given me the ability to stand strong in the face of any situation by the development of a positive mental attitude. In some cases, our school may provide child therapy. For example, from the self-confidence gained learning how to defend themselves, a shy, withdrawn child may become more outgoing and confident, while an aggressive child will become calm and respectful of others. Parents are truly amazed at the positive difference in attitude child develops after beginning c asses at WMAA. A child can walk proud with head held high. Each student learns to say "Yes I can' in life "
World Martial Arts Academy continually studies and improves its education programs. WMAA is providing a 3M Master Plan education: Master of Discipline, Master of Technique, Master of Degree, to the Black Belt Club for their highest achievement. Many different types of meditation exist. Meditation techniques can be used to peel away stress and frustrations, reduce anxieties and increase your ability to deal with any situation. Stress, when allowed to get out of control (or handled poorly) can be the cause of diseases like high blood pressure or ulcers. You will learn techniques to control stress and build a quiet place in your mind and body, so that you can take the worst that life can throw at you and come away a winner. Meditation can allow you to control your habits, quit smoking, overeating, or alcohol. Meditation will also enable you to think clearer, bring out your natural creativity, and much more. � 1998-2012 World Martial Arts Academy of St. Peters.